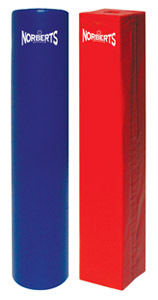 Norbert’s Post Pads feature a 40 ILD polyfoam core encased in a rugged 18 oz. vinyl-coated polyester cover and are available in both 2" and 4" thickness. We make stardard round and square pads to fit posts as big as 8" in outside diameter. All are provided with a Hook and Loop closure system for quick, easy installation and removal. NOTE: For a price quote on custom-size pads to accommodate larger round or square posts, please email or call 800-779-1904.